The HKM exercise blanket is breathable and ensures optimal sweat absorption. The blanket is made of 100% polyester polarfleece fabric of high quality and is extremely soft. 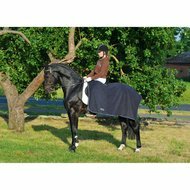 The blanket has saddle cut-out with Velcro closure and a leg strap. The blanket is maintenance friendly, washing machine resistant to 30 degrees and allowed in the dryer. spacious, warm exercise. keep legs warm. satisfied with product. nice warm soft blanket for after and before driving in the winter, your legs stay nice and warm. This blanket is perfect for the colder days. 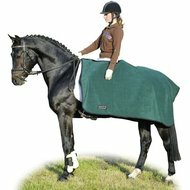 This blanket not only keeps the horse but also the rider warm. Blanket fits perfectly very satisfied, price quality very good.